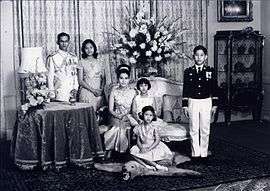 The Chakri Dynasty (Thai: ราชวงศ์จักรี; rtgs: Ratchawong Chakkri, Thai pronunciation: [râ:t.tɕʰá.woŋ.tɕàk.kri:], Pronunciation) is the current ruling royal house of the Kingdom of Thailand, while the Head of the house is the monarch. 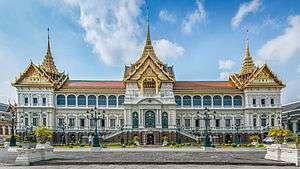 The dynasty has ruled Thailand since the founding of the Rattanakosin Era and the city of Bangkok in 1782 following the end of King Taksin of Thonburi's reign, when the capital of Siam shifted to Bangkok. 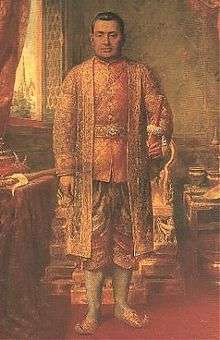 The royal house was founded by King Rama I, an Ayutthayan military leader of Sino-Mon descent. 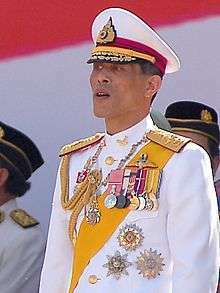 Prior to the founding of the dynasty, King Rama I held for years the title Chakri, the title of the civil chancellor (สมุหนายก). 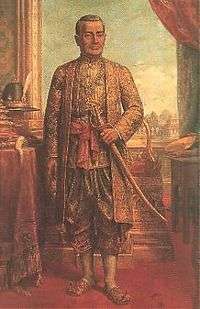 In founding the dynasty, King Rama I himself chose "Chakri" as the name for the dynasty. The emblem of the dynasty is composed of the discus (Chakra) and the trident (Trisula), the celestial weapons of god Vishnu and Shiva, whom the Thai sovereign is seen as an incarnation. 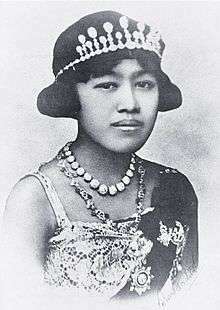 Princess Ubolratana Rajakanya (b. 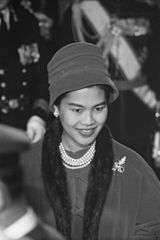 1951) eldest daughter of King Rama IX, renounced her right of succession for herself and her heirs upon her marriage in 1972. 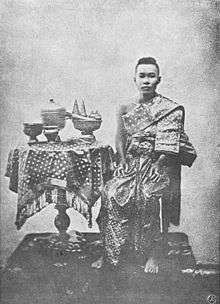 The Maha Uparat (มหาอุปราช) or the Krom Phrarajawang Bavorn Sathan Mongkol (Vice or Second King of Siam) (กรมพระราชวังบวรสถานมงคล) was an office that was bestowed on the highest ranking prince, frequently the monarch's younger brother or son. 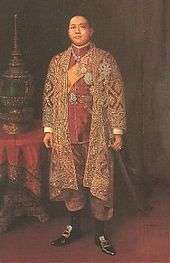 Until 1885 every Chakri monarch had appointed a prince to this office. 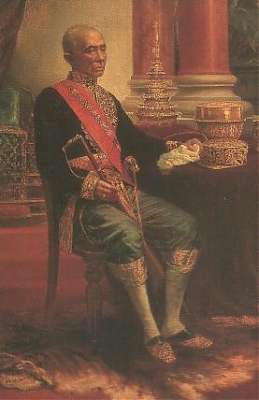 The Uprarat and his miniature court would reside at the Front Palace (วังหน้า) (a palace complex to the north of the Grand Palace, now the site of the National Museum). 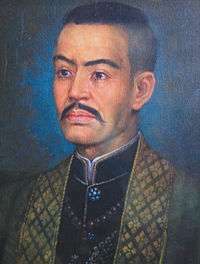 By tradition the Uparat was designated the heir to the throne, however only Prince Isarasundhorn was able to ascend the throne as King Buddha Loetla Nabhalai. 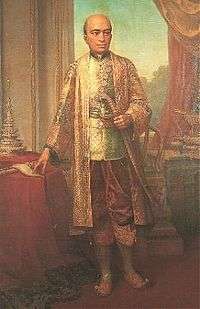 The office was extremely prestigious and carried with it almost equal status to the king, this can be seen in Prince Chutamani (younger brother of King Mongkut), who was elevated to Vice King Pinklao in 1851 (he carried with him the styles and titles of a King). 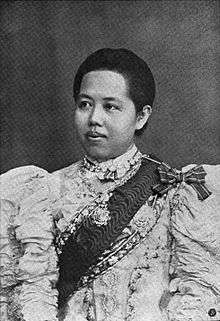 The office was abolished by King Chulalongkorn when his Uparat and cousin Prince Bovorn Vichaicharn died. 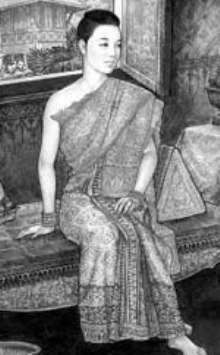 He then declared his oldest son the Crown Prince of Siam, but not Uparat. 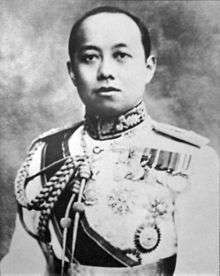 1 Sakdidej Bhanubhandhu ศักดิเดช ภาณุพันธุ์ Prince Chirasakdi Suprabhat. 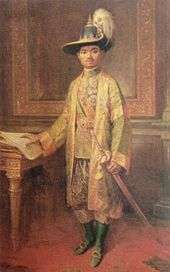 Although King Rama VII did not have any children, he adopted a cousin, youngest son of Prince Bhanurangsi Savangwongse, the Prince (Krom Praya) Bhanubandhuwongse Varadej Bhanurangsri. ↑ Terwiel, B.J. (2011). 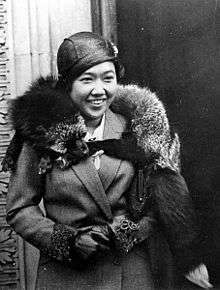 Thailand's Political History: From the 13th Century to Recent Times. Thailand: River Books. p. 39. ISBN 9749863968.